A simple soup, perfect for a rainy winter day. The German variation includes apples, parsnips and carrots to enhance the character of the butternut squash. Your recent winter CSA share included some yummy root veggies along with the butternut squash, potatoes and Fuji Apples. We decided to cook them up and turn them into a creamy, velvety comforting soup. Cut your squash down the center and remove seeds. Place face down onto a large baking sheet. Peel carrots and parsnips and remove the tops. Place on baking sheet along with your squash and put into your oven. Allow to cook for approximately 30-45 minutes (until your parsnips and carrots have a golden, roasted look) Remove your carrots and parsnips and set aside. Place your squash back into the oven for another 30-40 minutes or until fork tender. Peel and chop your onion and apples and add to a stockpot along with your butter on medium-low heat. Allow to cook until the onions are clear. Peel and chop your potatoes and add to your stockpot along with your roasted carrots, parsnips and vegetable broth. Cover and let simmer until potatoes and carrots are tender. At this point, your squash should be done cooking. Remove from your oven and set aside to cool. Remove the flesh away from the skin of the squash and place in your blender along with the half & half. Puree until smooth and add to your stock pot. Return to the stove and allow to simmer on low and stir well. Add your ginger, curry and salt to the pot. Your soup is ready to eat! Grab a bowl and dig in! If you give a mouse a few leeks and potatoes, he’s going to make some soup. If he makes some soup, you’re certainly going to have a mess to clean up. As the winter solstice has passed and the sun (hopefully) makes it’s triumphant return, we can keep our bellies full with some amazing recipes from our winter crops. In your December Holiday CSA share, you received a few leeks and root veggies to play with, include those wonderful yellow potatoes. There’s a plethora of things we can make with leeks and potatoes but potato leek soup is undeniably one of our favorites, so please enjoy this variation on a French classic! 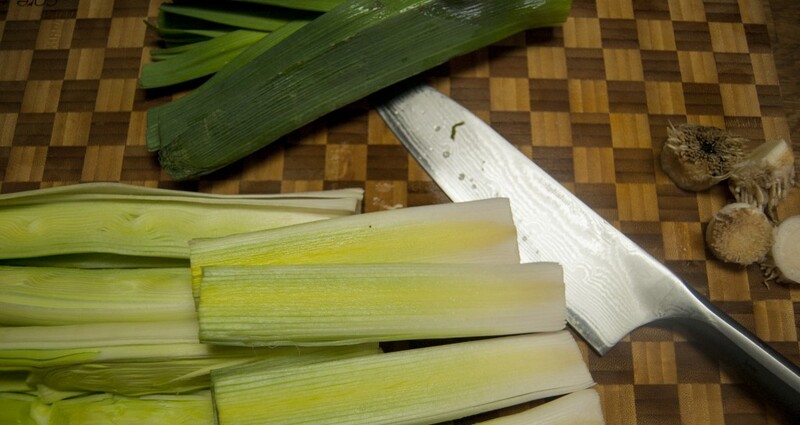 Remove the outer layer and cut your leeks in half, lengthwise. Rinse each of them by pulling apart all of the layers under cold water. Rinse these very well since leeks can hide lots of little dirty surprises inside. It’s the beauty of organic produce. Peel and smash your garlic cloves. Then, peel and quarter your potatoes (don’t forget to give these a bath either). 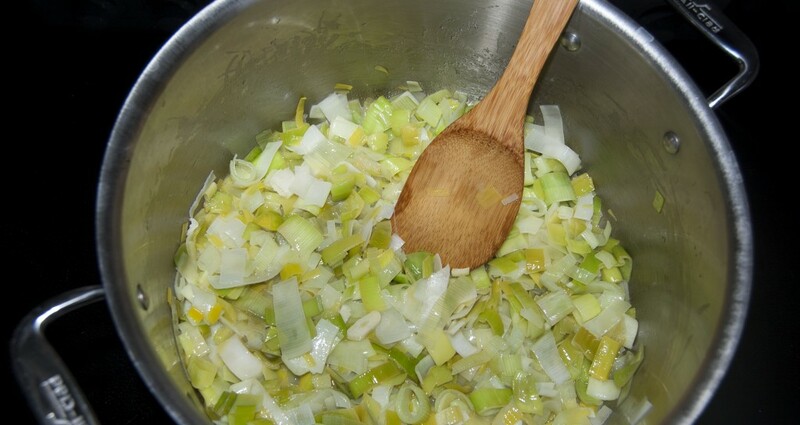 To begin making your soup, melt your butter in a large soup pot and add your chopped leeks and garlic. 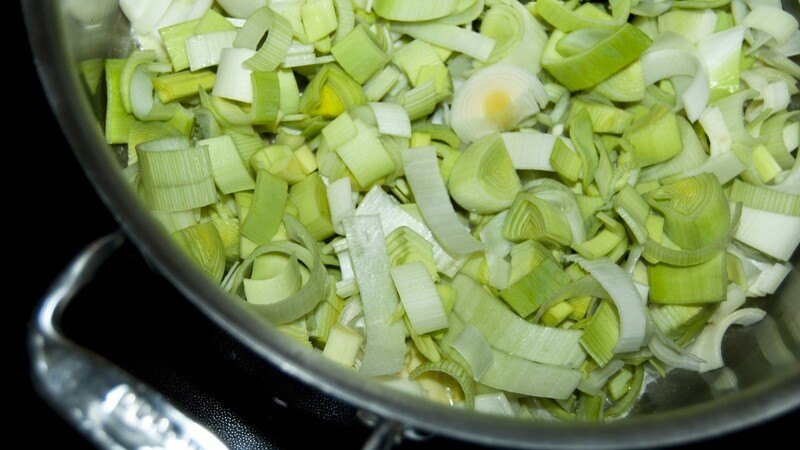 Add your 1/2 cup of wine to the pot and Cook your leeks on medium heat until they are soft and wilted. This should take around 10-15 minutes -be careful not to brown them. When these are done, they should look like the photo below. At this stage, add your potatoes, vegetable broth and bouquet garni wrapped in cheesecloth. You can also use the old leek wrapping method which I didn’t employ this time around. Not sure what this means? Check out how to make a bouquet garni from Williams Sonoma. 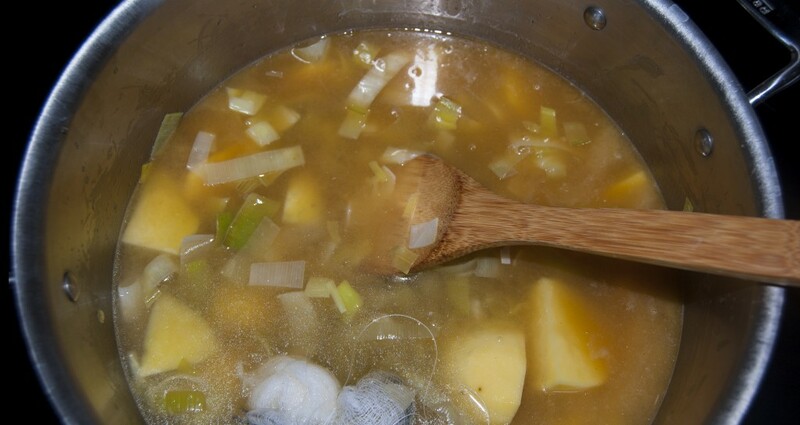 Bring to a boil then cover and let simmer for around 15- 20 minutes or until your potatoes are nice and tender. Remove and discard the bouquet garni. 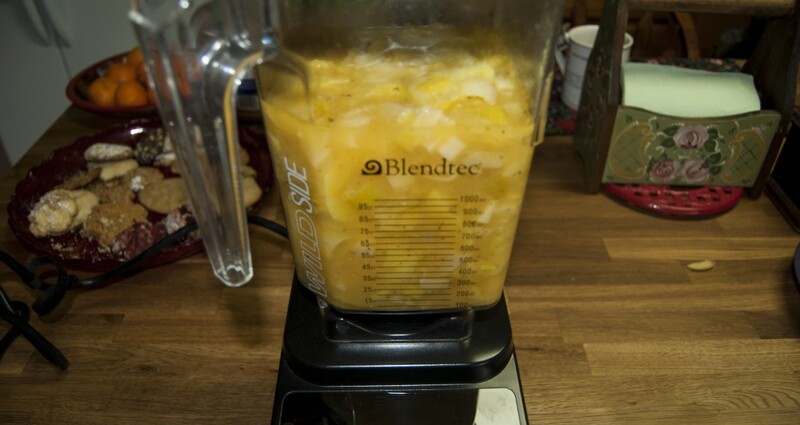 Purée your soup in a batches in your trusty blender or you can use an immersion blender. I’m taking the blender route with this one. 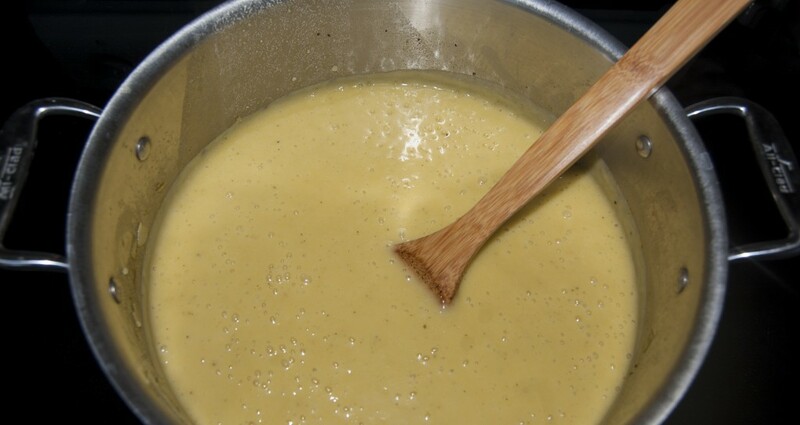 Blend your soup until it’s nice and smooth and return it to the pot. At this point, add your cup of heavy cream, salt and pepper to the mix. Bring your soup back to a simmer and adjust the seasoning to however you like. Serve hot and garnish with a little creme fraiche, parsley or chives. We used the Italian Parsley from our winter CSA box and a little creme fraiche. Only because we like to say creme fraiche. Creme fraiche!